Sometimes our pictures don't turn out as planned. We have blemishes or imperfections, there are unwanted background distractions, and sometimes people are missing from important pictures. Our image manipulation and restoration services can help. We have years of professional experience using Photoshop to restore and create unique images. We can take an old faded snapshot and convert it to a beautiful digital image. We can fix your once-in-a-lifetime photos to remove a fence and construction debris from your "perfect shot"
We can add/remove people, swap heads, or change the background of your images. We can remove blemishes, change the color of your dress, or help you lose 20 pounds! 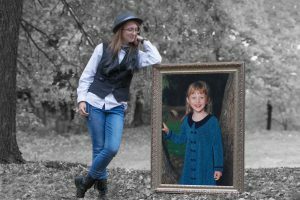 We can use existing images to create unique "remembrance photos" to honor a loved one on a special day. We can create a large mosaic using thousands of tiny images to produce wall art. Photoshop is a registered trademark of Adobe Systems Inc.